ROAD TAX 0 Zero, MOT valid until 18/06/2019. We will service the Mitsubishi prior to collection. 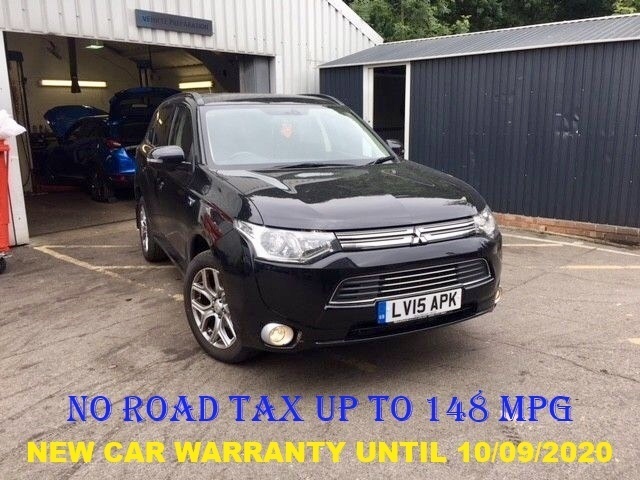 Also includes 12 months FREE RAC Recovery the balance of the Mitsubishi new car Warranty, valid until 19/06/2020 or 62,500 miles, whichever comes first. 1 Owner, Full Main Dealer Service History. Excellent Specification including Leather trimmed seats, Air Conditioning, 18" Alloy Wheels, Bluetooth, Bluetooth Audio, USB, Radio/CD, Voice Command (Link System), Cruise Control, Digital Stereo Radio & CD, Digital Climate Control, Electric Folding Mirrors, Hill Start Assist, Automatic Headlights, Front Wipers with Rain Sensor, Isofix Seat Belt Mountings and rear Door Child Locks, Multi-Information LCD Display, Chrome Line Exterior, Alarm System, Spare Key, Remote Central Locking, Multi-Functional Steering Wheel, Keyless Entry, Keyless Engine Start/Stop Button, All Round Electric Windows, Privacy Glass, Split Folding Rear Seats, Parking Sensors. SUPPLIED WITH STANDARD 13 AMP CHARGE LEAD - SO THE CAR CAN BE CHARGED FROM A NORMAL 13 AMP SOCKET. CHARGEMASTER & OTHER RECOMMENED SUPPLIERS TYPICALLY SUPPLY A HOME CHARGE WALL SOCKET FROM APPROXIMATELY £299. Full charge time approximately 5 hours. See figures below taken from the Mitsubishi Website. Deadlocks Active Stability Control, Daytime Running Lights, Airbag, Knee, Drivers Side, Traction Control.